The necessity of taking all imaginable care of those who may happen to be wounded in the country’s cause, urges us to address our humane ladies, to lend us their kind assistance in furnishing us with linen rags and old sheeting, for bandages. Women were aiding the cause with their nursing skills, but that was hardly their only contribution. The boycotts the colonists enacted in protest against British taxation seemed to involve products purchased mostly by women at the time, such as tea and cloth. Women ran the farms and businesses while their husbands were off fighting the Brits, and even participated in battle themselves when the need arose. 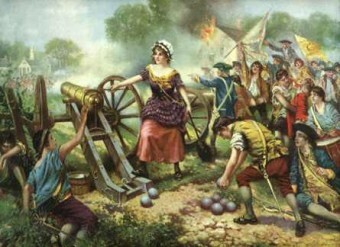 The legendary Molly Pitcher fought by her spouse’s side at Valley Forge, and helped fire the cannon when he collapsed. Lydia Darragh thwarted a surprise British attack on the Continental Army and General Washington himself, with the victory Washington achieved as a result turning the tide of the war. Had Darragh not gotten word of the ambush to Washington via Colonel Boudinot, it would have been the Continental Army who was trounced in that encounter rather than the other way around. All over the colonies women were sacrificing their safety, security, comfort, and sometimes their lives, to aid in the birth of their new country.